I forgot to tell you about some of my finishes in January so will take care of that unfinished business now. I did these while I was sick and totally forgot about them. It may have been mild for Oklahoma in June, but we are warming up to normal temps for July – very hot –had a couple of days in the 100s. Our garden has already burned up except for the okra. The okra plants are healthy looking but are not producing. In 50 years have never had that happen before, so no okra to put up this year. I did manage to put up all the green beans, asparagus, and tomatoes I will need for the winter though. My husband and I have also been busy helping our oldest granddaughter look at houses, condos, and townhomes with the goal of finding one she could afford in acceptable condition in a good neighborhood near the school where she teaches. She finally found a house in excellent condition within 2 miles of her school and the perfect size for her first home. We moved her in the last weekend of July. She is very excited about being a homeowner. She texted me a few days after moving in announcing that she believes she was born to be a homeowner because she is having a blast organizing and whipping things into shape. She’s so funny. In spite of all the canning and running around, I did manage to get quite a bit of sewing done. I ordered some titanium embroidery needles to use when I stitch the appliqués onto the placemats I am making for Christmas gifts. I was reading an article on stitching appliqués that have been applied to the fabric with fusible web. The titanium embroidery needles are touted to easily go through all layers without getting gummed up. Well, not so. Maybe they don’t gum up as much as regular needles but did gum up. No problem though since I have my Goo Gone ready when I need it. I have stitched down the appliqués on 5 of the 14 placemats and have quilted and bound 2 of them. There were no window treatments in my little sister’s new living quarters, so I took her old ones from the other apartment and remade them to fit the new windows. I also used some old draperies given to me by a niece to make a privacy panel to put behind the sheers in the bedroom window. A friend of our granddaughter gave her a sectional sofa which was in sad shape. Their dog had chewed through the upholstery on one corner and left about a 12” x 18” section bare all the way to the wood frame. Wish I had taken a BEFORE picture. Oh, well. So my husband and I went to JoAnn’s Fabrics and found a piece of chocolate brown vinyl that matched closely enough that one has to get very close to see the difference. Then we cut a piece of foam to fit that area and covered it with the new vinyl stitching it to the old vinyl at one end, stapling it to the frame at the top and the bottom where it doesn’t show, and tucking the other end into a joint between two pieces of the frame. Looks great! 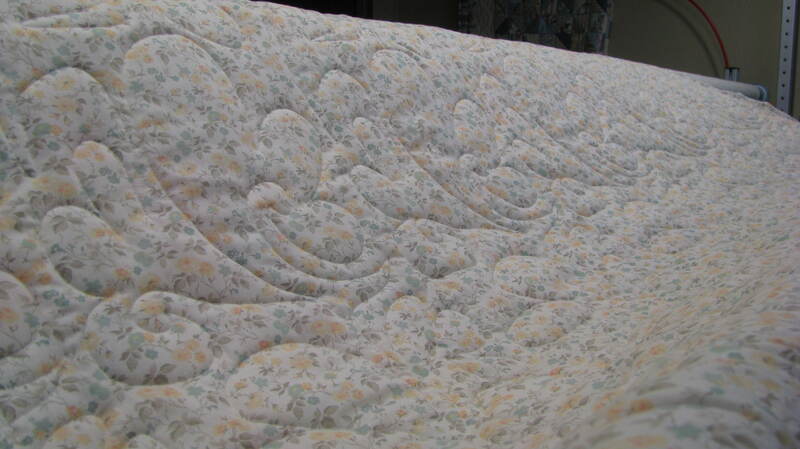 Then we replaced those too tall, too hard pillows that were across the back of the sectional. I bought 3 body pillows from Walmart. When our granddaughter came to the house, we had her try them out to make sure they were to her liking. She loved them. Next step was to find fabric to either match the seat cushions (which also needed work) or fabric that would coordinate with them. We picked up Haylee (the granddaughter) and headed back to JoAnn’s. It was Friday the 13th but our lucky day. 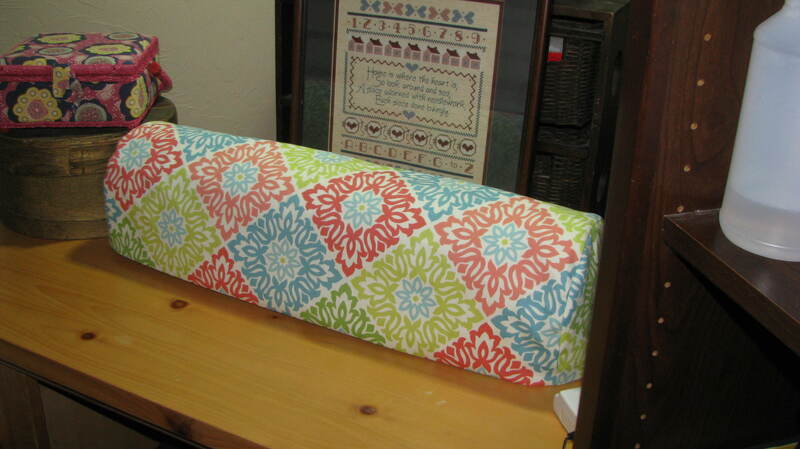 JoAnn’s had the exact upholstery fabric that was on those seat cushions. Can you believe that?!!! So now the seat cushions are spruced up and the body pillows covered. Then for throw pillows we picked up a piece of fabric that made 3 pillows, and I took the covers off the old pillows that were once the back of the sectional to make pillows 4 more. I had also saved the armchair covers from the 2 dark brown recliners we gave Haylee a while back and made a couple more pillows. Found all the pillow forms reasonably priced at Walmart. We saved the couch!!! LOL And here is Aspen enjoying it. Summer is here and although we have had some rather cool days for June, our days are starting to get up into the high 90s and very humid making it feel much hotter. Very hot days were predicted for the weekend we had the family reunion but Mother Nature decided to give us temperatures in the low to mid 80s with a nice breeze. It was wonderful! The reunion was a grand success, and we plan on having it at our place again next year. With the reunion, cleaning up, and getting everything back in their storage places, my crafting time this month has been cut short. And in addition to all that, my husband had surgery this month. So I played nurse for a few days. He’s not a good patient; but in all fairness, I am not a good nurse either. LOL But I have managed some finishes and some progress on other things. My weekly goal of three Quad Log Cabin blocks was met with 12 blocks completed. I now have a total of 110 blocks stored in that nice big white box waiting for the remaining 82 blocks to be completed. I love seeing the number of blocks completed increase as the other number decreases. It gives me just enough boost to keep me going on this long-term project. I got all of the appliqués fused to the 14 placemats. I hope to get them all stitched down in July, but it will be a tedious job so may take two months to do that. And if I decide to do the appliqué stitching by hand, I will allow myself three or four months to get them all done. That will leave plenty of time to quilt and bind them and have them ready for Christmas giving. To give you an idea of how tedious this is going to be, here is a picture of half a leaf and there are eight of these tiny intricate pieces to do on each of those 14 placemats. Yes, you did see that right. That piece is 2 1/2 inches wide x approximately 1 1/4 inches tall with a lot of ins and outs. 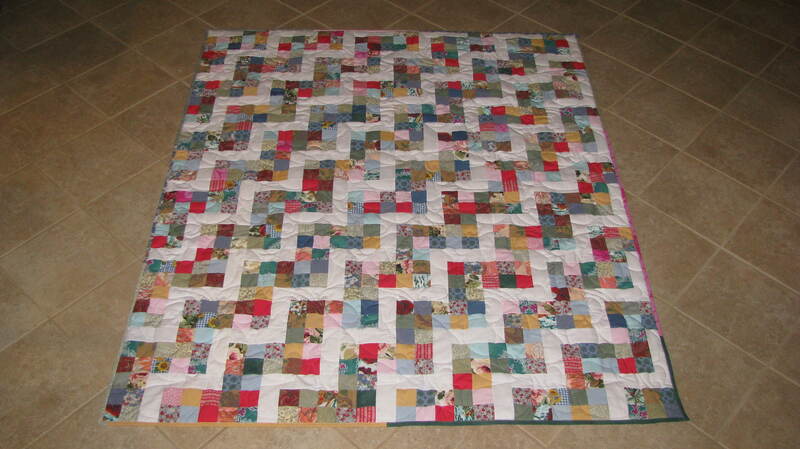 I finished quilting my nephew’s quilt. I did have a problem when quilting the outer border. My nephew pressed the seam between the inner black border and the outer orange print border toward the orange. Doing the beadboard quilting required me to stitch in the ditch which unfortunately in this case was on the black. Why was this a problem you ask? I was using a bright yellow/red/orange/green variegated thread, and I am not the best at stitching in the ditch. But I found a solution which cost me some extra time but worked. I used a black Pigma pen to color the variegated thread where it was not supposed to be showing but was. Now you see it; now you don’t. 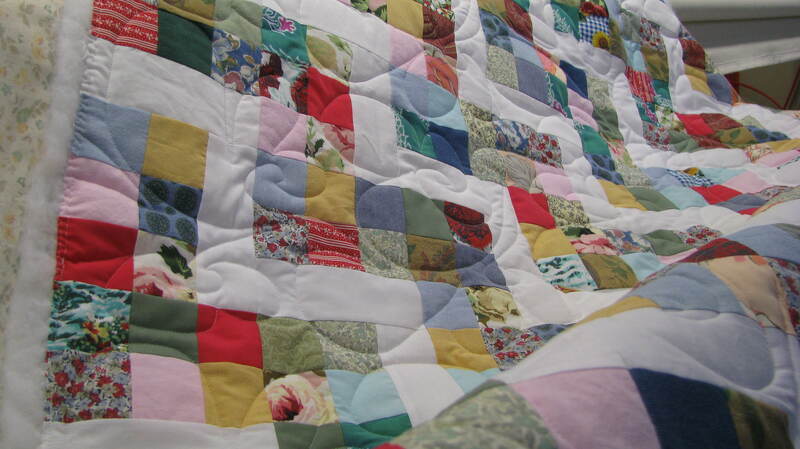 In spite of this minor problem, this quilt was such fun to quilt! My youngest sister moved from an apartment to a duplex and needed new curtains. She wanted light pink and blue in her kitchen, so I pulled all my blue and pink fabrics for her to choose from. She chose a very light pastel pink and blue plaid. I made simple cafe curtains with a valance and gathered them on spring loaded curtain rods. They look real cute, but I forgot to take a picture. Maybe I’ll remember to take pictures when I take the curtains to her for her dining, living, and bedroom which are now in the works. I have given up on my goal to finish a doll clothes pattern every other month. So far this year although three have been in the works, I’ve only finished one. I knew it was a lofty goal and gave it my best shot. But life got in the way. So doll clothes patterns have been removed from my goals list. But on a positive note, I’ve sold two copies of the one pattern that I published this year, and it has only been available for one month. Not one of my hottest patterns, but not a failure either. I did receive pictures from the coat pattern tester of her finished coat. It is as cute as can be. And she sent me some very good constructive comments that I hope to get incorporated into my instructions in time for a Fall release. 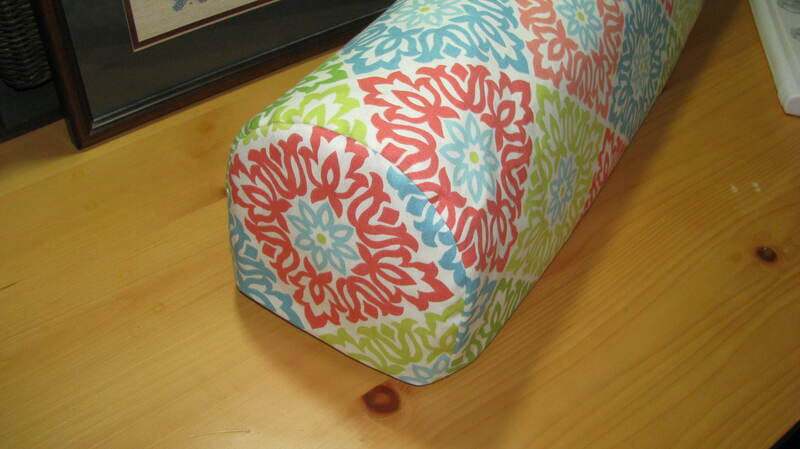 Oh, did I mention that my husband bought me a new sewing machine? It is a Bernina 590! I’ve already taken my classes and am definitely enjoying sewing on this dream machine. I hope to come up with an embroidery project soon so I can try out the embroidery module. Fun! Fun!